"Blueberries, oatmeal and whole wheat flour sounds awful, but tastes GREAT. My 5 year old and 19 month old love them." 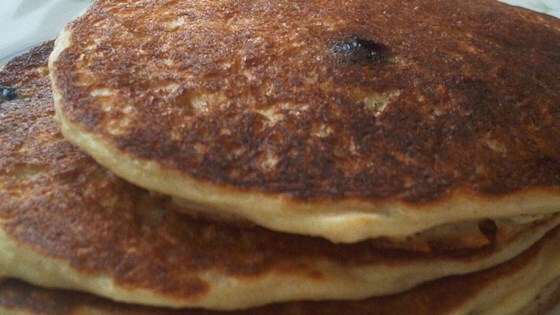 See how to make delicious blueberry pancakes from scratch. Not a fan. Mainly because it seemed the consistency was a challenge to cook up. This is hardly the same recipe after all the tweaking we've all done. I used buttermilk not soy & old fashioned oats not quick & vegetabe oil not olive. VERY GOOD! This is a keeper.